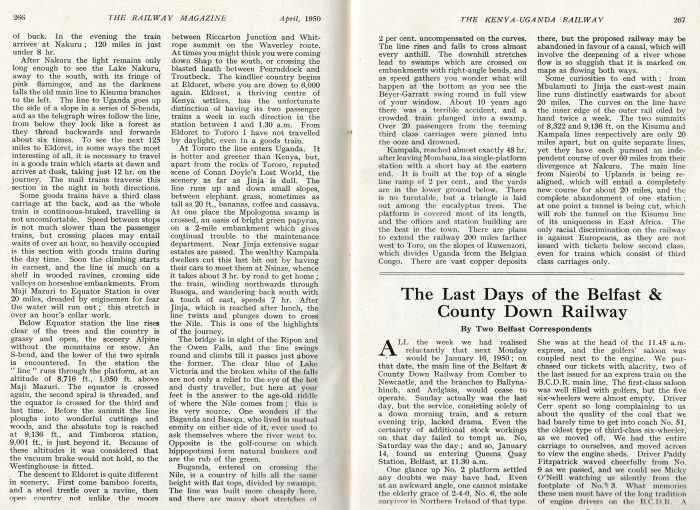 I have been looking through old railway magazines over the Christmas break this year (2018) and came across articles in the 1950 editions of the Railway Magazine which relate to this series of posts. The first is in the April 1950 edition of the magazine. ……..
At 10 a.m. on Wednesdays and Saturdays the down Uganda Mail starts from Kampala on its 884-mile journey to the coast at Mombasa. 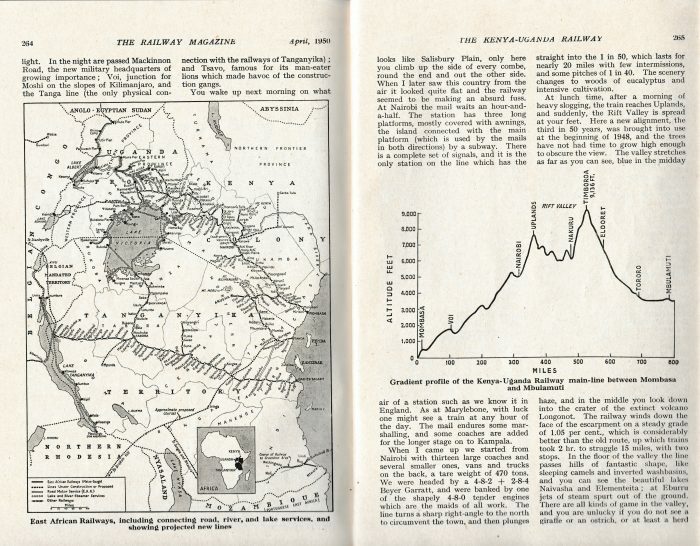 In its course it crosses the Nile within a mile of its source, the highest railway summit in the British Empire, the equator three times, and diagonally the Eastern Rift Valley and up the eastern wall of it. From Nairobi it drops over 5,000 ft. to the sea in little more than 300 miles, and the whole journey takes just under 48 hours. The Uganda Railway was begun on December 11, 1895, with construction on a few miles on Mombasa island and on the adjacent mainland. There was con¬siderable skepticism as to whether the line would pay, but its avowed intention was to put an end to the slave trade. The work was done at high speed and survey parties were always busy on the next section ahead of the construction. 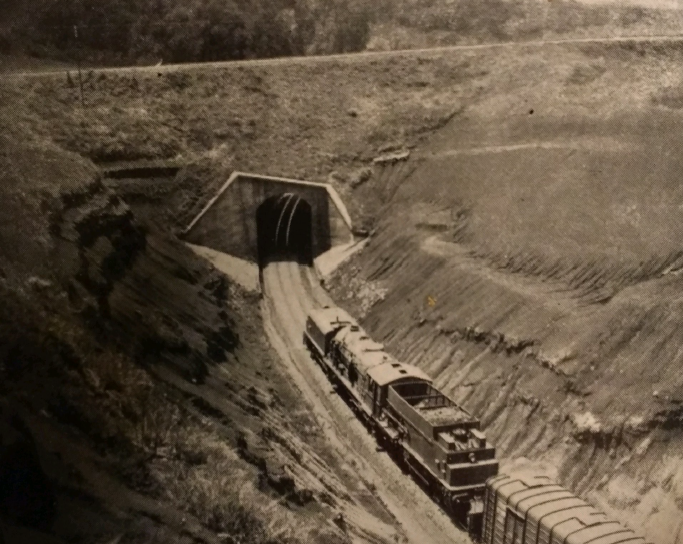 By 1899 the railhead had reached the further edge of the Athi Plain at mile 315, and halted while the survey parties went ahead, and a supply base was established at the foot of the hills. This spot has become Nairobi. Indians were imported to build the line to the metre-gauge (which it still remains). object of the builders was to push on to Uganda as quickly as possible; one result was that Kenya was ‘discovered’ on the way. After Nairobi the line climbed into the Kikuyu Hills and dropped down the escarpment into the Eastern Rift Valley. Such was the hurry to get the line open that the word ‘dropped’ is almost literal; a temporary line was laid to overcome this descent of 1,552ft on gradients varying from 1 in 7 to 1 in 1.75. This section was worked by ropes and for the steeper two parts a carrier was used for the trucks, as at Hownes Gill on the Stanhope & Tyne Railway in County Durham. The permanent line was brought into use in 1901, and the ‘lift’ remains only a scar on the hil-face. North-west along and across the bottom of the valley construction was easy, but at Nakuru the line had to begin to surmount the Mau Plateau over which it passes,with asummit of 8,322 ft. There are 27 steel trestle viaducts on this section, and the temporary line climbed down one side of the ravines on a gradient of 1 in 30, reversed and climbed out the other side on the same grade. From the summit the descent to the Lake is steeper, about 4,500 ft. in 80 miles. The first loco¬motive reached Port Florence (Kisumu) on Lake Victoria on December 20, 1901. Kisumu is 179 miles by water from Port Bell, which is 6 miles by rail from Kampala, the commercial capital of Uganda. 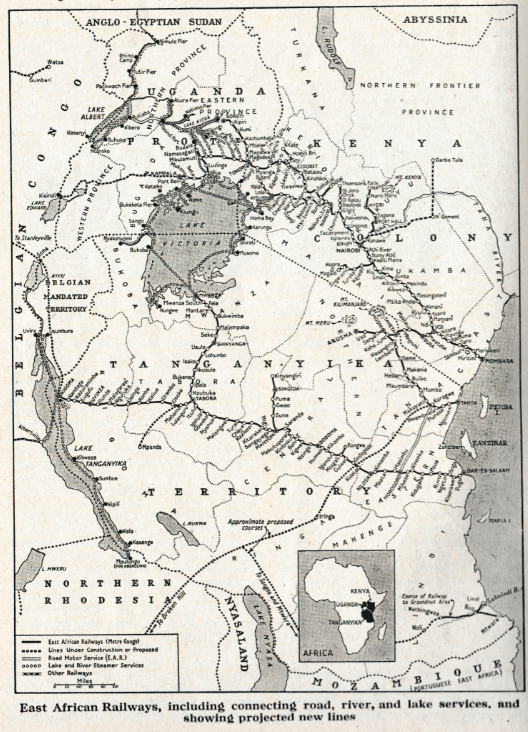 This land and water route remained the route to Uganda till the first half of the 1920s, when the all-rail route was completed, branching northwards from. 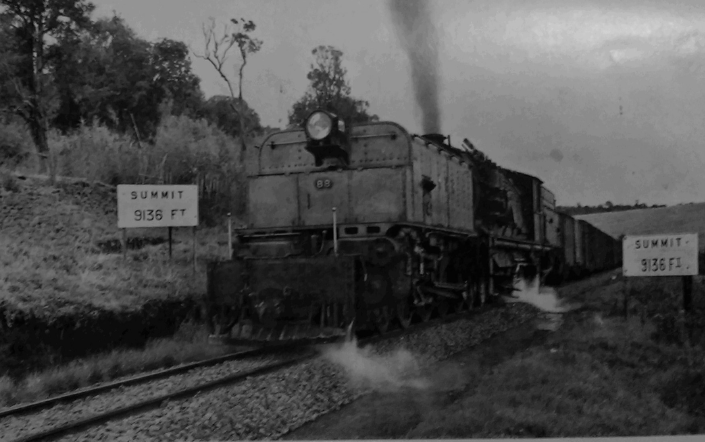 the Kisumu line at Nakuru and sur- mounting the Uasin Gishu Plateau near Timboroa, over the record summit of 9,136 ft. The line then descended into Uganda and joined the Busoga Railway, which was already in existence from Jinja to Namasagali, circumventing the rapids of the Nile. The junction, at Mbulamuti, about 30 miles north of Jinja, was reached in 1928. In 1931 the last section of the main line was opened, from Jinja to Kampala. The main engineering feature of this section is the single-span rail and road bridge over the Nile at Jinja, just below the Ripon Falls, where the Nile starts its 3,000-mile journey to the Mediterranean. The Uganda Railway reached Tororo, the first station in Uganda, in 1927; just before it reached the objective that its name implied, it was renamed the Kenya & Uganda Railway, which it remained till May 1, 1948, when all the railway and steamship services in Kenya, Uganda and Tanganyika amalgamated to form the East African Railways & Harbours. These lines have always been state railways, though they are administered as a separate department. A journey from Mombasa to Kampala is by no means dull. The mail train consists of about 13 carriages, three first, three second, three or four third, a restaurant car and two or three old first class non-corridor carriages used as seconds. This comes to about 400 tons tare. In addition, there are two vans for crew and three or four covered freight trucks. From Mombasa the train is worked by a Mikado, built in 1927 by Robert Stephenson, Darlington, originally intended for shunting, but now used on most passenger trains between Mombasa and Nairobi, where the lines are 80lb to the yard, laid in 40 ft. lengths. The ruling grade from Mombasa to Nairobi is 1.18 per cent. in the up direction and 1.05 per cent. in the down, apart from the first few miles, where it is 2 per cent. to get clear of the coast. Up means up¬country. All gradient posts are marked in percentages. The line is single throughout, with passing loops at most of the stations, and water at intervals of some 20 miles. Signals guard the entrance to each loop, one above the other on the one post, the top indicating the left-hand loop, and the bottom the right. There is a daily service from Mombasa to Nairobi, and twice a week the trains run right through to Kampala. The train leaves Mombasa at 4.30 p.m. and reaches Nairobi (315 miles) at 8.52 the next morning. First and second class carriages have side corridors, and the seats form sleeping berths at night, four to a compartment as the racks let down to form the upper berths. You wake up next morning on what looks like Salisbury Plain, only here you climb up the side of every combe, round the end and out the other side. When I later saw this country from the air it looked quite flat and the railway seemed to be making an absurd fuss. At Nairobi the mail waits an hour-and-¬a-half. The station has three long platforms, mostly covered with awnings. the island connected with the main platform (which is used by the mails in both directions) by a subway. There is a complete set of signals, and it is the only station on the line which has the air of a station such as we know it in England. As at Marylebone, with luck one might see a train at any hour of the day. The mail endures some mar¬shalling, and some coaches are added for the longer stage on to Kampala. When I came up we started from Nairobi with thirteen large coaches and several smaller ones, vans and trucks on the back, a tare weight of 470 tons. We were headed by a 4-8-2 + 2-8-4 Beyer Garratt, and were banked by one of the shapely 4-8-0 tender engines which are the maids of all work. The line turns a sharp right-angle to the north to circumvent the town, and then plunges straight into the 1 in 50, which lasts for nearly 20 miles with few intermissions, and some pitches of 1 in 40. The scenery changes to woods of eucalyptus and intensive cultivation. At lunch time, after a morning of heavy slogging, the train reaches Uplands, and suddenly, the Rift Valley is spread at your feet. Here a new alignment, the third in 50 years, was brought into use at the beginning of 1948, and the trees have not had time to grow high enough to obscure the view. The valley stretches as far as you can see, blue in the midday haze, and in the middle you look down into the crater of the extinct volcano Longonot. The railway winds down the face of the escarpment on a steady grade of 1.05 per cent., which is considerably better than the old route, up which trains took 2 hr. to struggle 15 miles, with two stops. In the floor of the valley the line passes hills of fantastic shape, like sleeping camels and inverted washbasins, and you can see the beautiful lakes Naivasha and Elementeita; at Eburru jets of steam spurt out of the ground. There are all kinds of game in the valley, and you are unlucky it you do not see a giraffe or an ostrich, or at least a herd of buck. In the evening the train arrives at Nakuru; 120 miles in just under 8 hr. After Nakuru the light remains only long enough to see the Lake Nakuru, away to the south, with its fringe of pink flamingos, and as the darkness falls the old main line to Kisumu branches to the left. The line to Uganda goes up the side of a slope in a series of S-bends, and as the telegraph wires follow the line, from below they look like a forest as they thread backwards and forwards about six times. 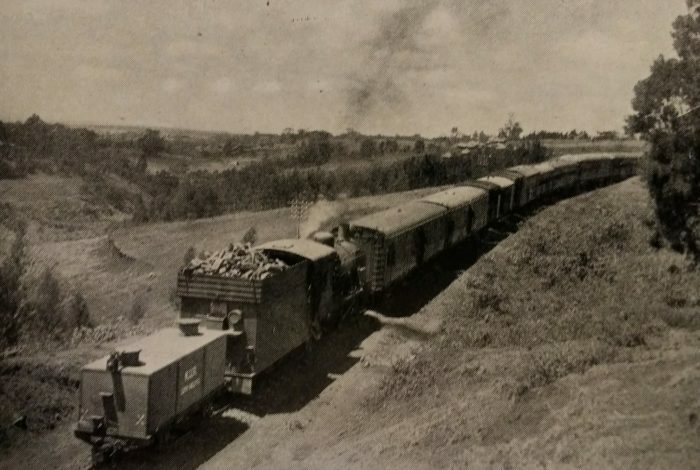 To see the next 125 miles to Eldoret, in some ways the most interesting of all, it is necessary to travel in a goods train which starts at dawn and arrives at dusk, taking just 12 hr. on the journey. The mail trains traverse this section in the night in both directions. Some goods trains have a third class carriage at the back, and as the whole train is continuous-braked, travelling is not uncomfortable. Speed between stops is not much slower than the passenger trains, but crossing places may entail waits of over an hour, so heavily occupied is this section with goods trains during the day time. Soon the climbing starts in earnest, and the line is much on a shelf in wooded ravines, crossing side valleys on horseshoe embankments. From Maji Mazuri to Equator Station is over 20 miles, dreaded by enginemen for fear the water will run out; this stretch is over an hour’s collar work. Timboroa station, 9,001 ft., is just beyond the Summit. Because of these altitudes it was considered that the vacuum brake would not hold, so the Westinghouse is fitted. The descent to Eldoret is quite different in scenery. First come bamboo forests, and a steel trestle over a ravine, then open country not unlike the moors between Riccarton Junction and Whitrope summit on the Waverley route. At times you might think you were coming down Shap to the south, or crossing the blasted heath between Penruddock and Troutbeck. The kindlier country begins at Eldoret, where you are down to 6,000ft again. Eldoret, a thriving centre of Kenya settlers, has the unfortunate distinction of having its two passenger trains a week in each direction in the station between 1 and 1.30 a.m. From Eldoret to Tororo I have not travelled by daylight, even in a goods train. At Tororo the line enters Uganda. It is hotter and greener than Kenya, but, apart from the rocks of Tororo, reputed scene of Conan Doyle’s Lost World, the scenery as far as Jinja is dull. The line runs up and down small slopes, between elephant grass, sometimes as tall as 20 ft., bananas, coffee and cassava. At one place the Mpologoma swamp is crossed, an oasis of bright green papyrus, on a 2-mile embankment which gives continual trouble to the maintenance department. Near Jinja, extensive sugar estates are passed. The wealthy Kampala dwellers cut this last bit out by having their cars to meet them at Nsinze, whence it takes about 3 hr. by road to get home; the train, winding northwards through Busoga, and wandering back south with a touch of east, spends 7 hr. After Jinja, which is reached after lunch, the line twists and plunges down to cross the Nile. This is one of the highlights of the journey. Baganda and Basoga, who lived in mutual enmity on either side of it, ever used to ask themselves where the river went to. Opposite is the golf-course on which hippopotami form natural bunkers; and are the rub of the green. Buganda, entered on crossing the Nile, is a country of hills all same-height with flat tops, divided by swamps. The line was built more cheaply here, and there are many short stretches of 2 per cent. uncompensated on the curves. The line rises and falls to cross almost every anthill. The downhill stretches lead to swamps which are crossed on embankments with right-angle bends, and as speed gathers you wonder what will happen at the bottom as you see the Beyer-Garratt swing round in full view of your window. About 10 years ago there was a terrible accident, and a crowded train plunged into a swamp. Over 20 passengers from the teeming third class carriages were pinned into the ooze and drowned. Kampala, reached almost exactly 48 hr. after leaving Mombasa, is a single-platform station with a short bay at the eastern end. It is built at the top of a single line ramp of 2 per cent., and the yards are in the lower ground below. There is no turntable, but a triangle is laid. out among the eucalyptus trees. The platform is covered most of its length, and the offices and station building are the best in the town. There are plans to extend the railway 200 -miles farther west to Toro, on the slopes of Ruwenzori, which divides Uganda from the Belgian Congo. There are vast copper deposits there, but the proposed railway may be abandoned in favour of a canal, which will involve the deepening of a river whose flow is so sluggish that it is marked on maps as flowing both ways. Some curiosities to end with: from Mbulamuti to Jinja the east-west main line runs distinctly eastwards for about 20 miles. The curves on the line have the inner edge of the outer rail oiled by hand twice a week. 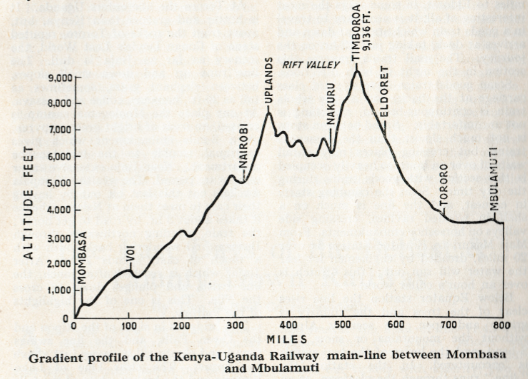 The two summits of 8,322 and 9,136 ft. on the Kisumu and Kampala lines respectively are only 20 miles apart, but on quite separate lines, yet they have each pursued an independent course of over 60 miles from their divergence at Nakuru. The main line from Nairobi to Uplands is being re-aligned, which will entail a completely new course for about 20 miles, and the complete abandonment of one station; at one point a tunnel is being cut, which will rob the tunnel on the Kisumu line of its uniqueness in East Africa. The only racial discrimination on the railway is against Europeans, as they are not issued with tickets below second class, even for trains which consist of third class carriages only. 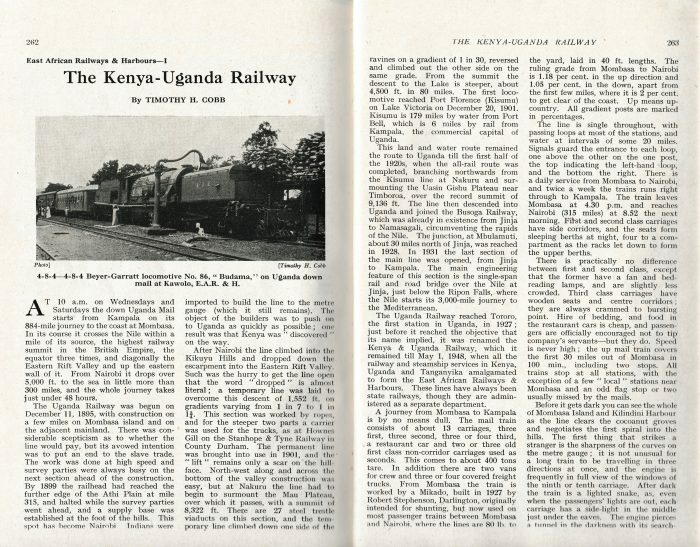 Thomas H. Cobb; The Kenya-Uganda Railway; in The Railway Magazine No. 588 Vol. 96 April 1950, p262-267. The Railway Magazine April 1950, p250. The Railway Magazine April 1950, p265. The Railway Magazine April 1950, p264. The Railway Magazine April 1950, p251. This entry was posted in Comment, Railways Blog, Uganda and Kenya Railways on December 28, 2018 by rogerfarnworth.